There is just something appealing about having bright, colorful hanging baskets that are full of flowering plants as part of your outside decor. Hanging baskets require a little different care than the flowers you grow in your garden. 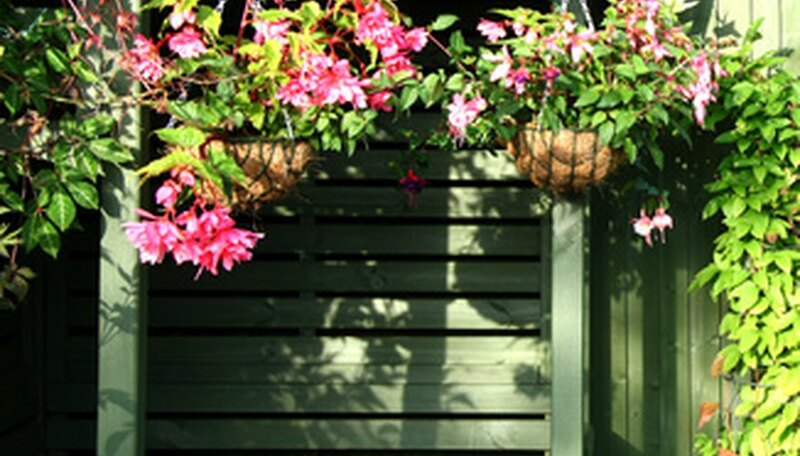 Giving your flowering hanging baskets the proper attention can keep them blooming continuously throughout the warm weather months. Match the flowering plants in your hanging basket to the environment where they will hang. In other words, if you plan to hang your basket on the north side of your home, or in partial shade, select plants for your basket that will grow well in partial shade, like fuchsias, impatiens or begonias. Sun-loving flowering plants that are popular for hanging baskets are geraniums and petunias, among others. Water your hanging baskets daily, thoroughly. Hanging baskets, like container plants, tend to dry out much faster than plants in the ground because the soil is exposed more to the heat of the day. You will need to water your hanging baskets every day and probably twice a day when the temperatures are really hot, such as in the 90-plus degree (Fahrenheit) range. Water your hanging baskets until water runs out of the drain hole in the bottom to ensure you have moistened the entire basket. If you have a catch sauce under your basket, leave it full of water for about 10 minutes after watering, then dump the excess water. Fertilize your hanging baskets with a liquid fertilizer that is a 1:2:1 ratio mix, like 10-20-10. The 20 indicates the percentage of phosphorous, which will promote your plant's producing continuous flowers. You should feed your hanging baskets every week or two to keep the flowering plants healthy and growing with flowers. Hanging baskets, like containers, lose a lot of the vital and needed nutrients in the soil because frequent watering washes away and removes nutrients with no way for the plants to acquire additional nutrition from surrounding soil. Therefore, for healthy, thriving plants in your hanging basket, you must continue to feed them. Clip dead flowers from your flowering hanging plants to encourage them to continue flowering instead of creating seed pods. You may also pinch or clip back new growth if you want fuller, bushier foliage in your hanging baskets. If flower buds on your hanging plants start to drop before opening, it may be because you are leaving dry pockets or areas of soil when you water the basket. Make sure you are watering the entire hanging basket.